Looks like the trusted source back in March on an O2 Germany Lumia 900 release was spot on. From the same source, WMPoweruser has now received a pictured flyer and some more information. By the end of next week, the Nokia Lumia 900 Windows Phone will be fully available through O2 in Germany. The Lumia 900 will sell at €541 unlocked or €22.50 for a 24 month purchase plan. The Lumia 900 will be available in black, white and cyan. O2 will be running a specific promotion for the white Lumia 900 under the “White Sensation” title. 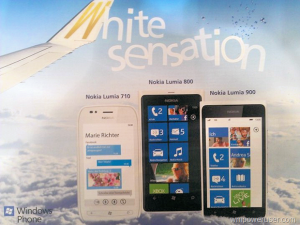 The Lumia 710 and Lumia 800 will also be included in the “White Sensation” promotion.